How do people experience government promoted ideas of peace after mass atrocity? 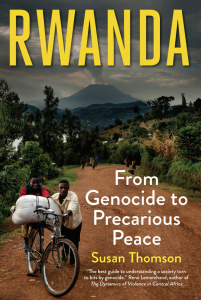 Susan Thomson, Associate Professor of Peace and Conflict Studies, explores this question and more in Rwanda: From Genocide to Precarious Peace (Yale University Press). Skeptical about Western media claims of the inherent violence of the Rwandan people made during the 1994 genocide, Susan Thomson focused on the stories of those who lived through the atrocities in her second book on Rwanda. Thomson explores government-initiated programs for peace and reconciliation almost a decade following the genocide between the Hutu and Tutsi by highlighting the lived experiences of everyday Rwandans. She analyzes the historical factors which shaped present-day Rwanda and looks to the future. Thomson credits the support of the Peace and Conflict Studies department for aiding in the book coming to fruition. In teaching courses, including War and Lived Experiences and Gender in Peace and Conflict, Thomson incorporates her fieldwork into themes such as the ways gender shaped individual experiences of violence and the ethical concerns that arise when studying as an outsider. Beyond the classroom, Rwanda: From Genocide to Precarious Peace allows the general public to immerse themselves in this critical framework of acknowledging various perspectives as Thomson’s study is written with a popular audience in mind. Her book raises serious questions about the stability of the current peace, the methods and motivations of the ruling regime and its troubling ties to the past, and the outlook of the future.